There has always been a slight suspicion surrounding the drinking water at OHS, prompting students to jokingly and seriously question the cleanliness and safety of our school water. However, the true nature of the strange-tasting liquid had never been truly investigated until recently when staff members of The Viking Voice utilized a small kit to conduct a simple water test. Little did we know, what we had perceived to be a simple test, likely to reveal merely a trace amount of harmless matter, would in fact lead to much more. We knew, without doubt, that the water had to be unique in some way; for this very reason, the initial results of our test were perplexing beyond measure. According to the test, the water contained no bacteria, lead, pesticides, or any other harmful or unwanted substance beyond a slight golden tint and the presence of many bubbles. In fact, it was not simply the lack of harmful substances that was perplexing; the water was so clean that it seemed also to contain no minerals or tannins despite the fact that water of a yellowish tint should have a reason for being so. In addition, we knew at heart that our water could not possibly be ordinary – not while having that signature flavor so familiar to OHS students. Suspecting an obscure bacteria beyond the scope of our tiny water kit, we proceeded to send the small vial of apparently clean water, still bubbling suspiciously, to the famous yet simultaneously unknown top hydrologist Dr. Stanley P. Davidson, to be tested at his isolated yet extremely high-tech water testing facility in Bozeman, Montana. Dr. Davidson, enthusiastic about the prospect of obscure water contaminants, eagerly complied. Expecting delayed results if any, we were shocked to receive a reply after a disturbingly short length of time; on March 12, 2018, at the precise and monumental minute of 2:37 pm in the computer lab, the mind-blowing truth was finally revealed in a very short email from Davidson himself. He revealed that the vial of water we had sent contained no contaminants and in fact was actually not water at all. “Your ‘water’ is literally pure champagne,” explained Davidson. He concluded the email with the confession that he would not be returning our vial of champagne and instead would be taking it to the annual Davidson family reunion that very weekend. We were so enlightened by the monumental discovery and fueled by the adrenaline then rushing through our arteries, capillaries, and veins that we did not care in the slightest that our historically important vial of champagne had been stolen by a hydrologist in Montana, and we instead turned to the important matter at hand: the “water”. We quickly realized that the clear signs indicating that the water was actually champagne had always been there. There had always been a suspicious eagerness to “go get water”, or to “go fill up a water bottle”, especially during class, that had always been intriguing and now finally could be explained. In addition, even students known for not usually hydrating properly and for disliking the taste of the school water had always had full water bottles, and students “hydrating” before a sports game had always seemed to suffer from extreme “nerves”. The true reason for the yellow color and bubbles present in the water was now painfully obvious; it was difficult to understand how we had not realized it before. This revelation also provides the perfect explanation for OHS sports performance. “It never did taste like water,” a senior remarked upon learning that he had been filling his water bottle with champagne before every soccer game, basketball game, baseball game, cross country meet, golf match, football game, sailing regatta, and crew regatta he had played in during his high school career. “That explains why Orcas sports teams are usually one of the last in the league. I always felt kind of odd during the games; we all did, I guess. There was one game where I actually felt normal, and now that I think about it, that was the one time I filled up my bottle at home.” The fact that many students who do not bring water from home display suspicious behavior in class, that we previously referred to as “disruptive” or “disorderly”, can now also be attributed to the consumption of champagne. 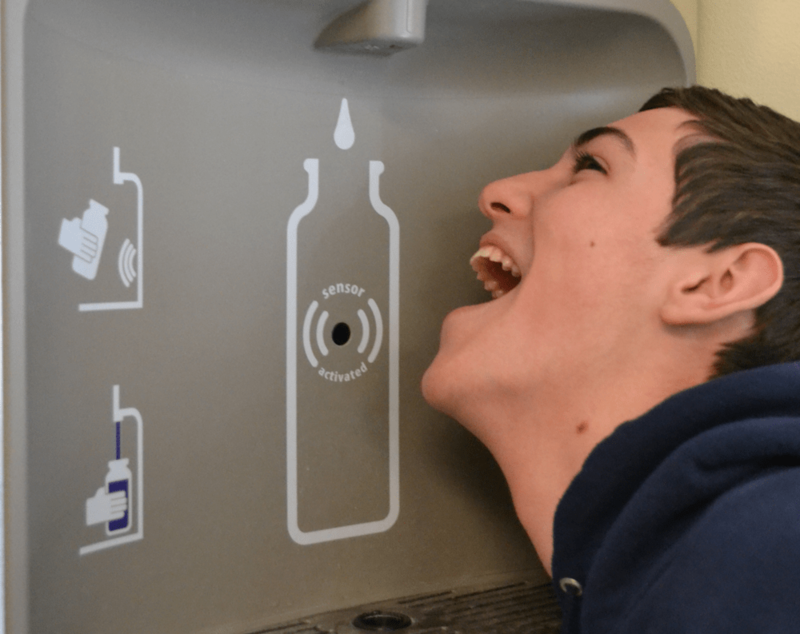 The flow of golden, bubbling liquid continues to stream from sinks, drinking fountains, and toilets throughout OHS, as well as the new water bottle filler, yet the source remains unknown and untraced.